Unmanned aircraft systems are becoming big business. It’s estimated the Department of Defense will spend as much as $80 billion on unmanned aircraft in the next 10 years. Phyllis Johnson, vice president for research and development at the University of North Dakota, says Grand Forks is at the epicenter of a growth industry. There was a lot of uncertainty in the area when the Department of Defense recommended realignment for the Grand Forks Air Force Base back in 2005. 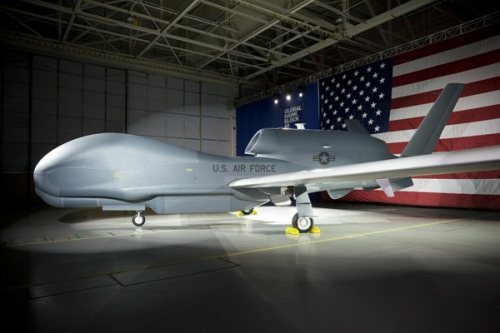 Thankfully, instead of seeing it close with the departure of the 319th Refueling Wing, a new mission developed around the emerging use of unmanned aerial vehicles. And while the RQ-4 Global Hawk isn’t scheduled to arrive until next year, it’s already having a positive impact on Grand Forks. Just this afternoon, a ribbon-cutting ceremony was held down the hallway from where I work in the Center For Innovation to celebrate the opening of Northrop Grumman’s new Grand Forks office. According to Minnesota Public Radio, they expect to have about 100 employees here within the next two years. In addition, area educational institutions are getting involved, too. The University of North Dakota is now offering the world’s first degree in Bachelor degree in unmanned aircraft systems operations and Northland Community and Technical College in Thief River Falls is preparing to train mechanics qualified to fix and maintain the Global Hawk unmanned aircraft. Having this new industry in the region also presents an opportunity for entrepreneurs and small businesses. Locating a supporting manufacturing or software in Grand Forks provides easy access to the United States Air Force, Northrop Grumman, and a variety of UAV training and educational resources. It’s possible that our little city could play a key role in this industry for well into the future. Grand Forks owes a big thanks to North Dakota’s Congressional delegation and city officials for their years of hard work in making this opportunity possible. Between this and the potential for clean and renewable energy in the state, we’re positioning ourselves well for the future.